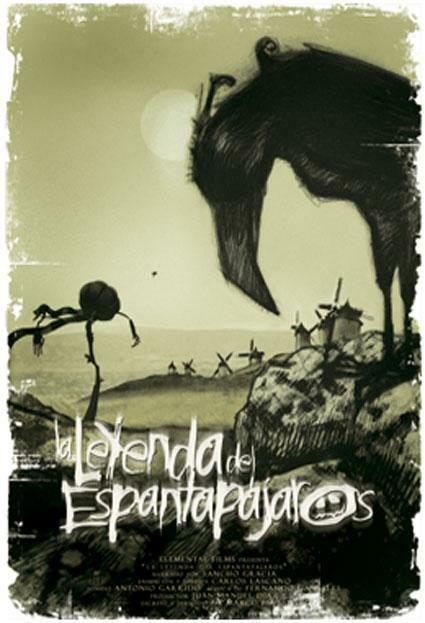 The Legend of the Scarecrow (La leyenda del espantapájaros) is a 10 minute short Spanish film about a lonely scarecrow who befriends birds and heals a bird that thinks that scarecrows are evil. The Scarecrow is caught and is locked in the windmill which they burn and the crows scatter his ashes. My sister suggested that I watch it as foreign films were better to write about than the latest blockbuster movies, if you wanted a challenge. Anyway, I watched the film on Youtube, having low expectations. Some foreign films bore me to sleep, but I kept watching this one. Although the Scarecrow looked more like a pale pumpkin with arms and legs (he was intended to have that, I think), I carried on watching it as the story unravelled in the ten minutes right up until until the scarecrow’s unfortunate ending, which I admit, made me cry. I would recommend it to anyone, whether you want to brush up on your Spanish or if you somewhat enjoy dark yet melancholy tales. I like the effect that it which many other cartoons or short films don’t possess. Although the guy who narrated (Sancho Gracia) is now dead, I liked how his gravelly tones drew the focus compleately to the story and what was happening on screen. It’s a bit of a dark film, and despite it being a cartoon film it isn’t too good for children. I would probably think of it as a Spanish take on a Tim Burton movie and the animators probably drew influence from Burton’s work. This movie won over 20 awards and was animated by Argentinian animator Carlos Lascano, who I have never heard of before I even watched the film nor had I watched any Spanish movies either. If it would have been in English it would have ruined it. There is something about the language of Spanish that is rather calm and haunting, maybe poetic that makes the film the way it is. It is a rather basic storyline too, so he kept it plain but complex story with themes of prejudice and fear. On a first viewing of the film, you don’t expect for it to get as dark as it does. On the other hand, there’s nothing bad to say about it. Despite its dark themes, it has alot of heart and is almost told in the style of a fable. Since watching The Legend of The Scarecrow, I have been introduced to more of Lascano’s animation and want to watch more of his short films because his style seems to be breaking away from the usual animation styles that we are exposed to through movies on a day to day basis. Its use of the computer animation programme Maya and the implementation of Photoshop to portray the bleak backgrounds of the fields and the windmill will whet the appetite of any animation boffin. It doesn’t appeal to everyone, but give it a watch anyway. If you like movies, books and more, check out my blog here. Next Post Your Favourite Female Director?